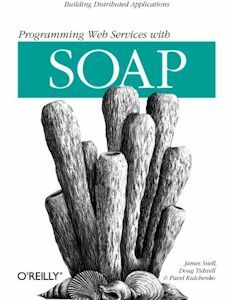 SOAP (Simple Object Access Protocol) is a protocol standard managed by W3C (World Wide Web Consortium). Microsoft, IBM (International Business Machines) and Apache have all implemented it. SOAP is a lightweight protocol for exchange of information in a decentralized, distributed environment. It is an XML (extensible Markup Language) based protocol that consists of three parts: an envelope that defines a framework for describing what is in a message and how to process it, a set of encoding rules for expressing instances of application-defined datatypes and a convention for representing remote procedure calls and responses. Now you know. :-) It is an idiotic acronym that makes in almost impossible to find information about SOAP on google. SOAP is a species of XML with envelopes to help you tell what kind of data you have. If you have many different sort of messages going back and forth over your HTTP (Hypertext Transfer Protocol) connection, SOAP provides a way of identifying them and packing data in a standard way. The price you pay is obscene overhead. You could look on SOAP as a stripped down CORBA (Common Object Request Broker Architecture) or a language-agnostic RMI (Remote Method Invocation) designed to sell more bandwidth. SOAP is usually piggybacked on HTTP, but it could be sent over raw sockets, or even in theory exchanged in files sent by sneakernet. It is just XML. Microsoft retired the SOAP toolkit in 2005. O’Reilly’s comparison of IBM and Microsoft SOAP. Soap.org has nothing whatsoever to do with the SOAP protocol, neither does pg.com. SOAP had a burst of interest around the year 2000. A number of books were published, then nothing has been published since. 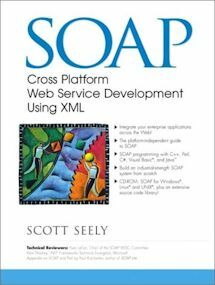 This is more for the big picture that details of how to write XML and SOAP code. SOAP programming with C++, Perl, C#, Visual Basic and Java. Assumes you can already code. Includes source code example.